Snipe It Now! is the easiest way to snipe! To place a bid, all you have to do is click Snipe It Now! from any eBay item page. The Snipe It Now! window will automatically appear with the auction number already filled in. Just fill in your bid and click the Add button and your snipe will be added to your My Snipes folder just as if you were signed in to Auction Sniper. Make sure that your links toolbar is visible. 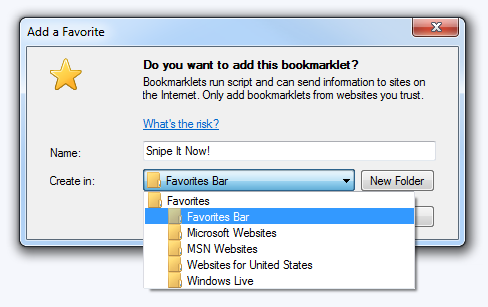 If you don't see it click View -> Toolbars -> Links.